Home > News > Darlington College staff brought a touch of Las Vegas to its Glasshouse restaurant in support of St Teresa’s Hospice. Darlington College staff brought a touch of Las Vegas to its Glasshouse restaurant in support of St Teresa’s Hospice. Posted on 7th December 2018 at 9:15 am. FUNDRAISING was left to lady luck as a college transformed itself into a charity casino to raise funds for a popular cause. Local businesses, including staff from hotels, were asked to spin the roulette wheel and place their bets, take to the card table and go ‘higher or lower’, using ‘funny money’ to beat the odds. Catering tutors and students prepared and served a feast of canapes while guests enjoyed the activities and shopped from a display of calendars, Christmas cards and natural therapies prepared by hospice specialists and used by patients, including essential oils, burns gel, soothing fragrances and room and pillow sprays. 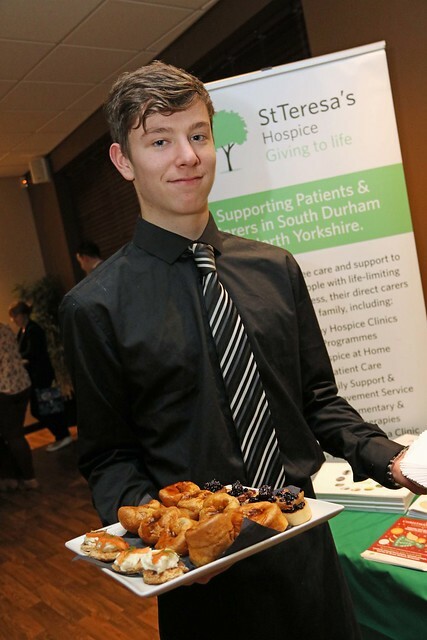 Hospice Fundraising and Marketing Manager John Paul Stabler said: “We work closely with the college on a range of matters, from fundraising to apprenticeships, and were thrilled when they offered to stage an event like this. For more information on opportunities with both organisations visit www.darlington.ac.uk and www.darlingtonhospice.org.uk.